Smile, Caroline, you're on TGC! See that yellow house in the middle? Yeah, the Tanner family lived there! I know you though, you're here for the food. A soup recipe in the middle of August? I know, it’s cruel and highly unusual considering 99.9% of the country in melting away in 100+ degree heat waves. But you see, I live in the .1% of the country whose summer only just started. Yes, you read me right, most days we don’t crack 80 degrees. Just two or three weeks ago, it was in the 60’s, raining and I was eating my body weight in Pho just to stay warm. My family was out visiting and I found myself saying over and over again “I swear it’s nicer in Seattle in the summer, I swear.” Then I left for San Francisco and when I came back, it has been continual high-70’s sunny days. With low humidly. I probably shouldn’t have told you that. Now you’re all going to move here and my rent will go up. Please ignore the last paragraph and read all my other posts about the rain here. And STAY AWAY. So this soup – it’s healthy, full of fresh veggies and relies on (hopefully) some of your pantry staples. If you don’t have lentils continually on hand, please, head over to your nearest Whole Foods/Food Co-Op/bulk grocery store, grab the biggest bag you can find, fill it up, don’t break your back carrying it home and enter lentil land. I’m also happy to say this recipe is 95.6% my own. 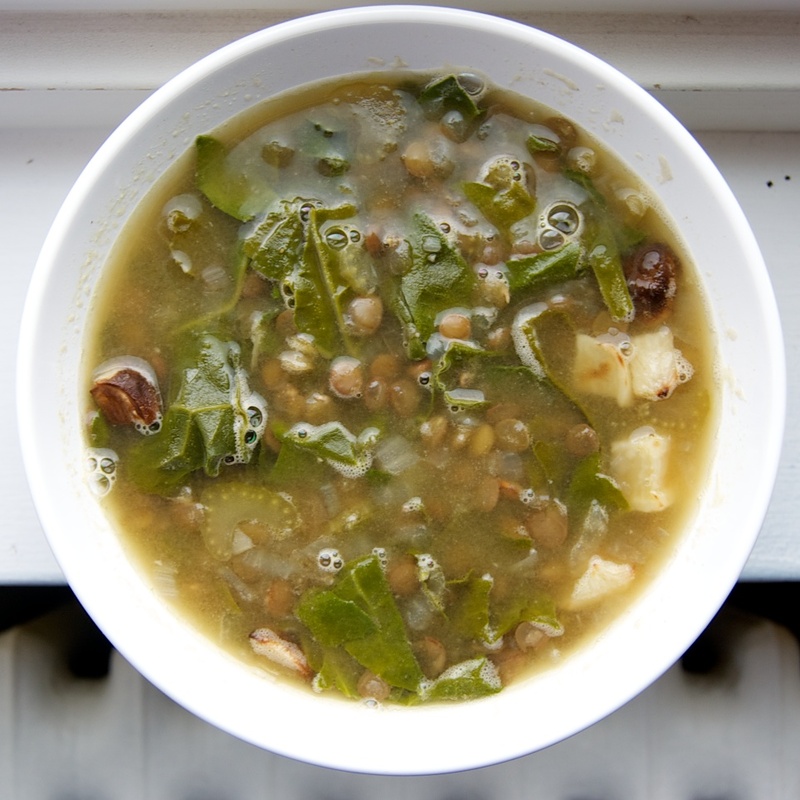 Researching the contents of my CSA box, I had never cooked with turnips before, and looking at what's in my pantry, this soup just kind of came to be. It’s pretty adaptable for any ingredients you have on hand. Just replace the turnips with another root vegetable (taters, carrots... bigger turnips), the chard with another cooking green and you could even substitute the lentils with white beans, or something of the like. Heat the oven to 400 degrees. Peel and dice the baby turnips into approximately ½" cubes. Spread the turnips evenly on a jelly roll pan, toss with olive oil and season with salt & pepper. Roast for 20-25 minutes or until the edges are brown, taking care to stir halfway through cooking. Saute the onion and garlic in a enameled cast iron pot (or any other heavy-bottomed pot) until the onions are translucent and starting to brown. Add the vegetable broth, lentils, some more salt & pepper and spices. Bring up to a strong simmer. Partially cover the pot and cook for about 40 minutes. If you notice that the soup seems to be drying out, add more vegetable broth or water. Stir in the chard and turnips until the chard begins to wilt, about 10 minutes. Add in some hot sauce, but don't feel obligated. A few dips of Tabasco sauce adds spice to the dish.